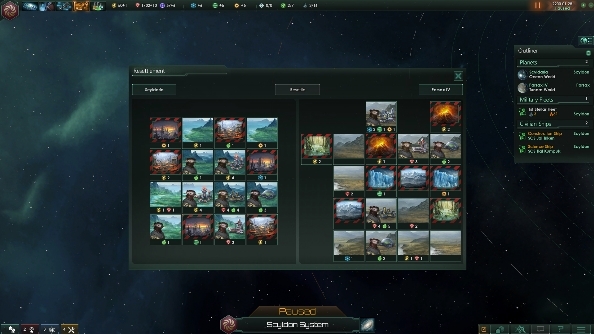 Paradox’s Stellaris is shaping up to be an incredibly deep galaxy-spanning strategy game, and the devs continue to show us how far down the rabbit hole goes with a few new tidbits about planetary populations. Stellaris features a vast cast of races and types of people, and the way they live their lives may influence your policies. If you like your decisions deep, then you need to play some of the best strategy games on PC. Take migration, for instance. This Stellaris dev diary explains that you can tailor your empire’s approach in a variety of ways. Are you a massive xenophobe who wants to keep your planets pure and free of aliens? Just revoke migration privileges for anyone other than your ‘founding’ species. For the more open-minded ruler, make spontaneous migration available to all to see populations mix based on their personality. Decadent races may, for instance, gravitate towards planets that have slaves. Yes, Stellaris allows you to enslave populations and force them to work. This makes them much more effective labourers, but does result in rubbish scientists. They can also band into factions should they take less than kindly to being forced into thankless unpaid positions, so do watch out for that. Migration can also be forced, with you demanding that populations resettle on a new planet. This comes at a huge cost, but certainly has benefits for the rigid galaxy planner. Should one population of people become… out of hand… you can ‘purge’ them. ‘Purge’ is clearly a softer way of shouting genocide from the rooftops, and results in both your own and other empires going absolutely mental. Clearly only an awful galactic ruler would opt to such extremes measures, so we expect you to stay away from this tactics at all costs. We can trust you, right? In other Stellaris news, you can watch the developers take their Blorg empire into the stars with streams every Thursday, hosted by Martin “Wiz” Anward and Anders “cKnoor” Carlsson. The first can be watched below.